Stamina and stability. 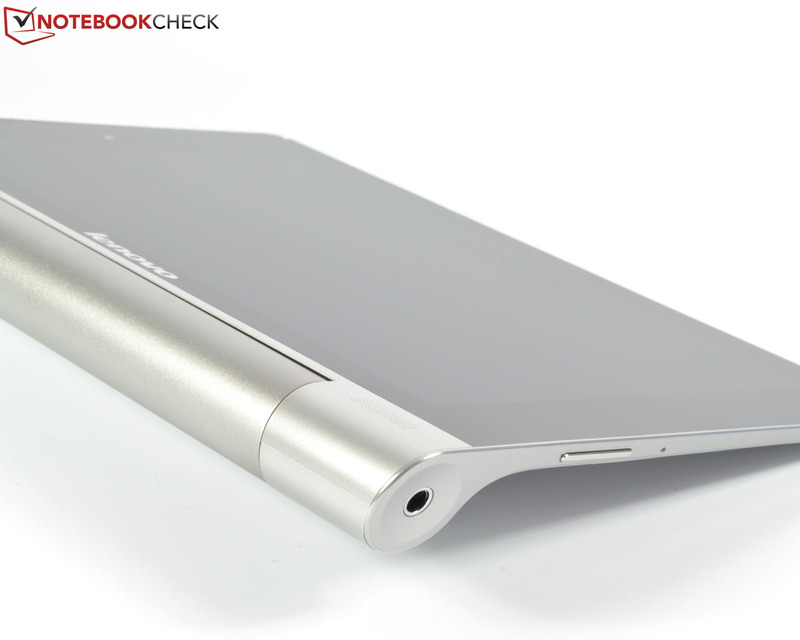 Both are quite the virtues of the Lenovo Yoga Tablet 8, thanks to its large 6000 mAh battery and the integrated kickstand. But what about the rest of its ingredients? While both the bright 8-inch IPS display and the unusual shape make for great eye-catchers, we will have to see whether the MediaTek MT8389 SoC with 1.2 GHz, 1 GB of RAM and 16 GB of internal storage space suffice to remain competitive in the price segment below 300 Euros (~$412). 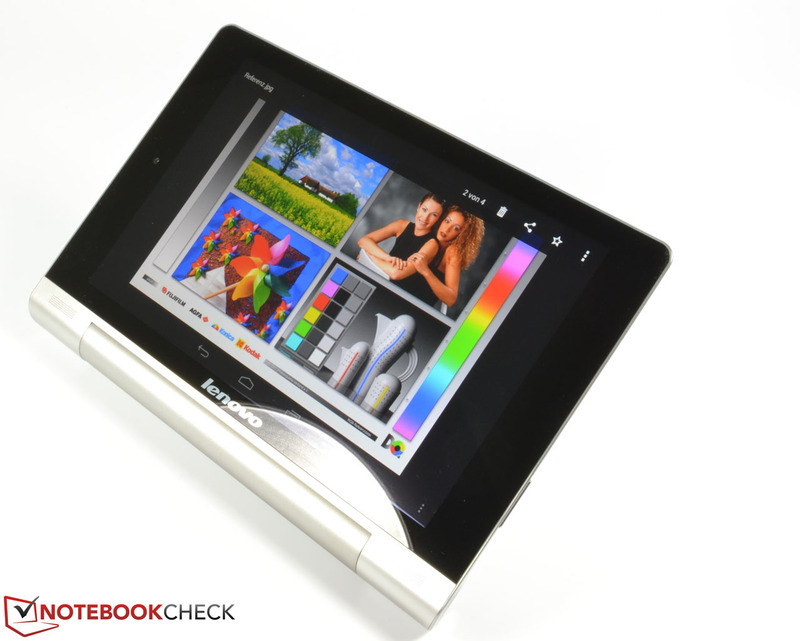 Not content with just the Yoga Tablet 10, Lenovo expands its multi-mode product portfolio by a more portable device, the Lenovo Yoga Tablet 8. 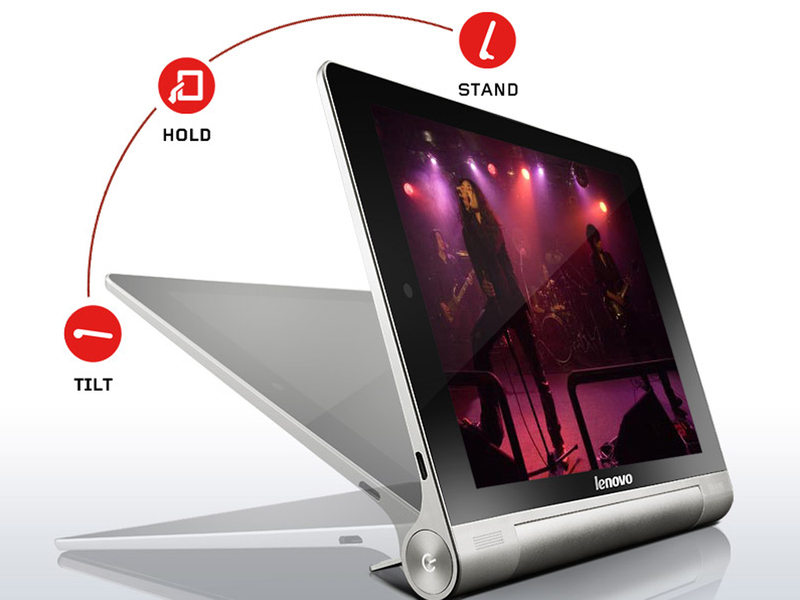 Its integrated kickstand is supposed to be a unique selling point with which Lenovo tries to differentiate itself. It allows for three different usage modes, namely angled, stand and hand mode. 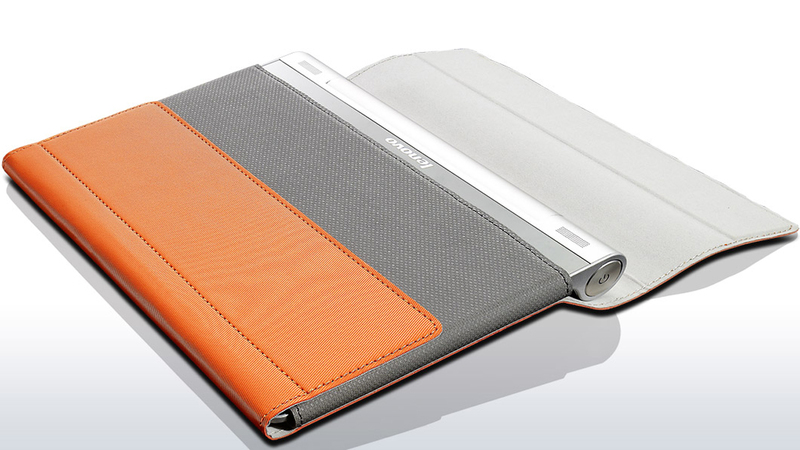 The unusual chassis reminds us a bit of the Sony Xperia Tablet S which resembles an opened magazine. The Yoga Tablet 8 uses a similarly thickened lower section for a very pragmatic reason: The cylindrical part houses a large 2-cell battery with 6000 mAh which is supposed to lead to great runtimes. 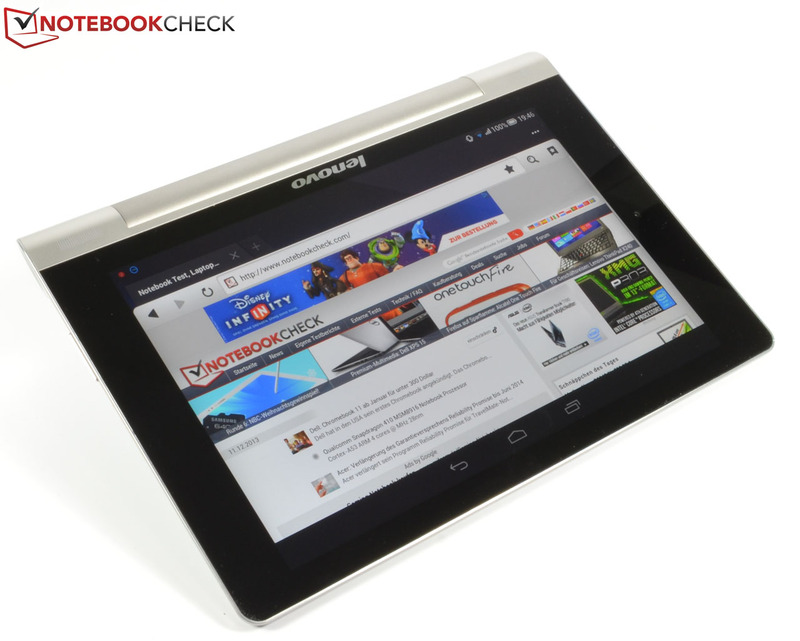 At the same time, the rest of the tablet is extremely slim, allowing the overall product to yield excellent ergonomics. 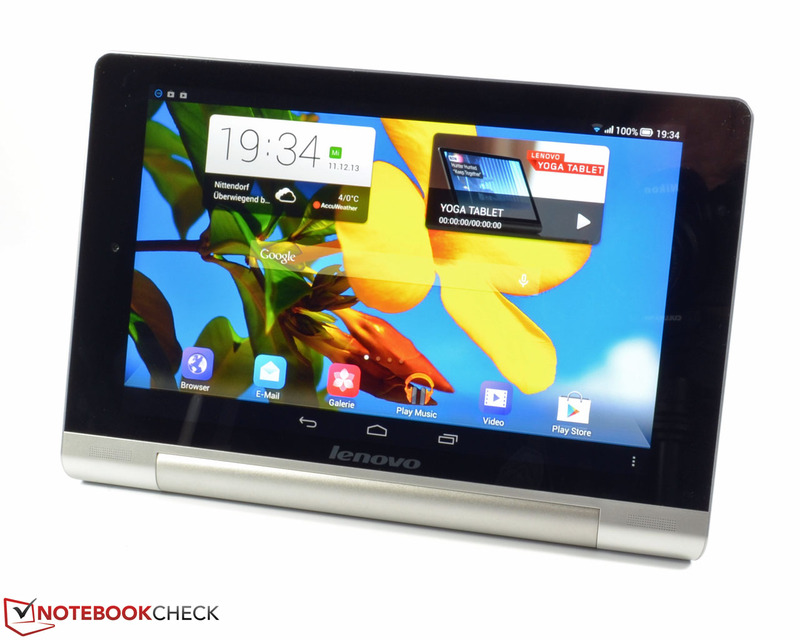 Lenovo equips its Yoga Tablet 8 with a MediaTek MT8389 quad-core SoC with a clock speed of 1.2 GHz, 1 GB of RAM and 16 GB of flash storage. Variants with more storage are not available at the time of writing, but thanks to a microSD slot, its storage space can be expanded easily and affordably. Our test sample comes with both a 3G module and a micro SIM slot, but the resolution (1280x800) of its 8-inch IPS display is a bit on the low side when compared to competitors such as the Google Nexus 7. In terms of features, the Lenovo Yoga Tablet 8 is an exact replica of the 10-inch variant (which costs 70 Euros, ~$96, more). In both cases, a non-UMTS variant can be had for 50 Euros (~$68) less. Our test device (with 3G) ships for an RRP of around 280 Euros (~$384). 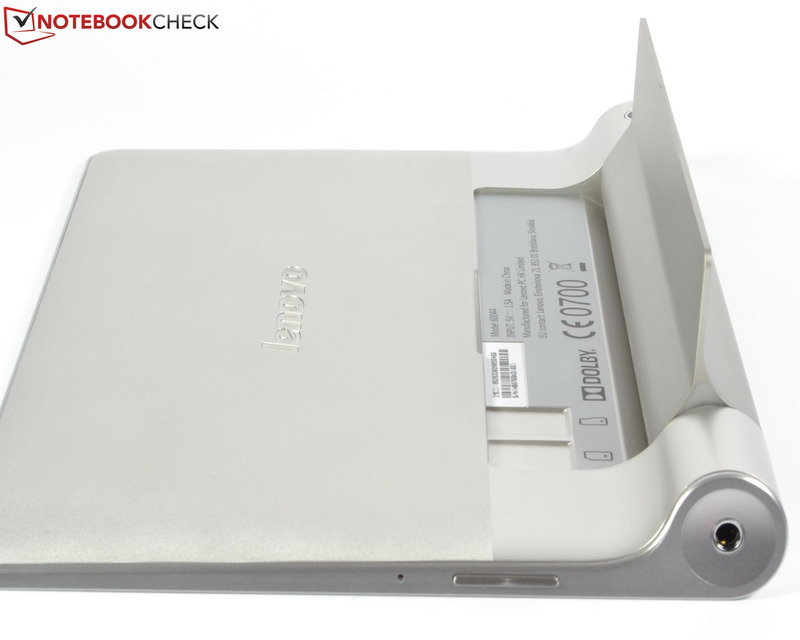 The chassis of the Lenovo Yoga Tablet 8 differs considerably from most of its competitors thanks to its unusual design. The cylindrical part (diameter: 21 millimeters) houses both the battery and a kickstand, allowing the rest of the tablet to remain very slim. The thickened lower end also leads to great ergonomics. In “hand mode”, our test device felt great to hold. The angled appearance when placed flat down on a table or one’s lap also helps with typing, even when the kickstand is not being used. Its dimensions of 224 x 154 millimeters and its thickness of 3 to 21 millimeters are approximately on par with that of its competitors. The same doesn’t hold true for the overall weight of 401 grams (mostly due to the large battery and kickstand) which is approximately 80 grams more than that of most other 8-inch tablets. 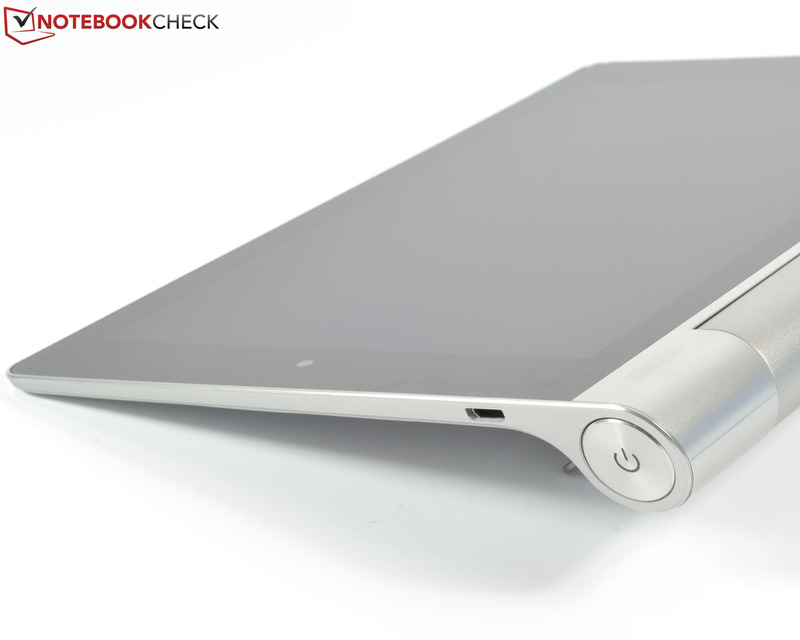 The majority of the Lenovo Yoga Tablet 8 is made from silverish plastic, only the kickstand and the physical buttons consist of aluminum. The rear part comes with a ribbed surface for better haptics. Unfortunately, the Yoga Tablet 8 has the same problem as its larger-sized brother, the Lenovo Yoga Tablet 10, when it comes to the large clearances around the physical buttons. In addition, the Yoga Tablet 8 does not feel very torsion-resistant. Applying pressure to the back results in color distortions on the screen. 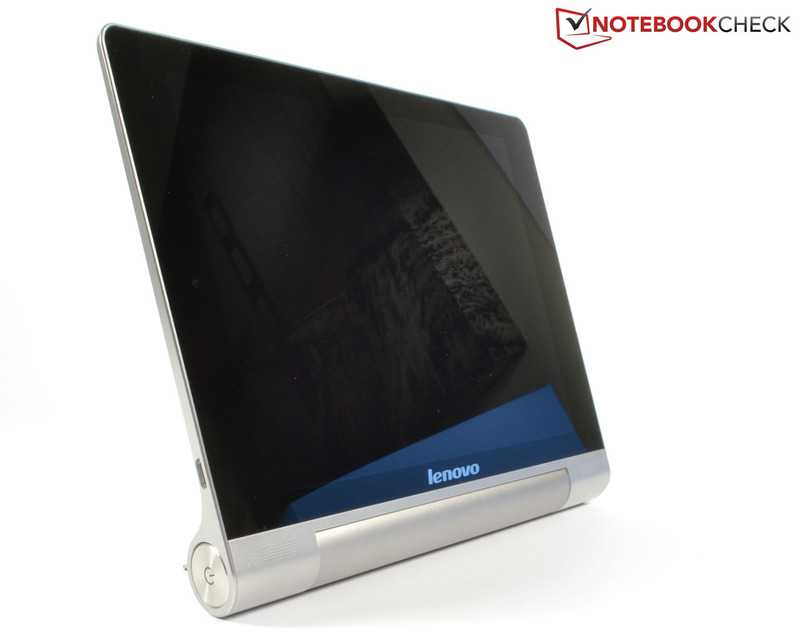 The integrated kickstand comes with strong hinges rendering it unwise to try to pry it open. It is much easier to just rotate the entire cylindrical part of the tablet, as is shown in our video. 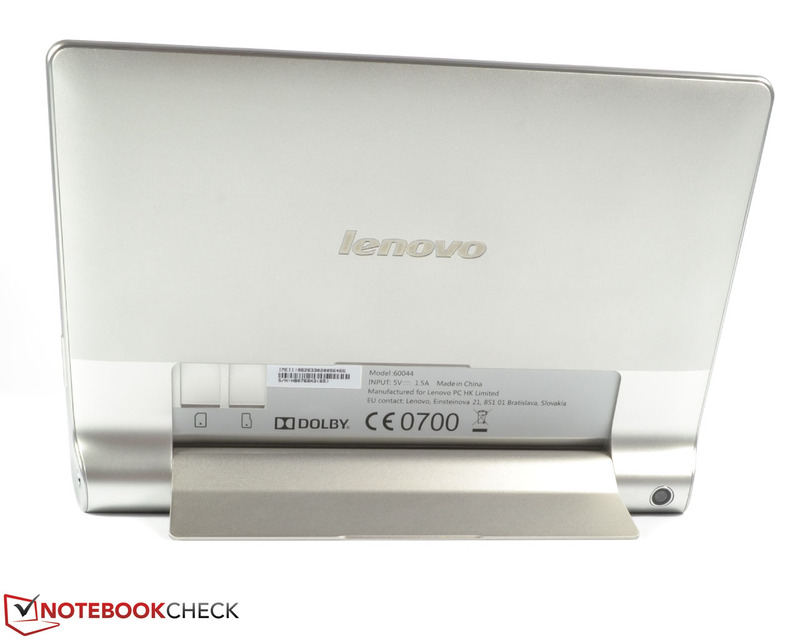 Lenovo includes two transparent silicone pads which can be attached to the kickstand in order to prevent from sliding across smooth surfaces when used in stand mode. 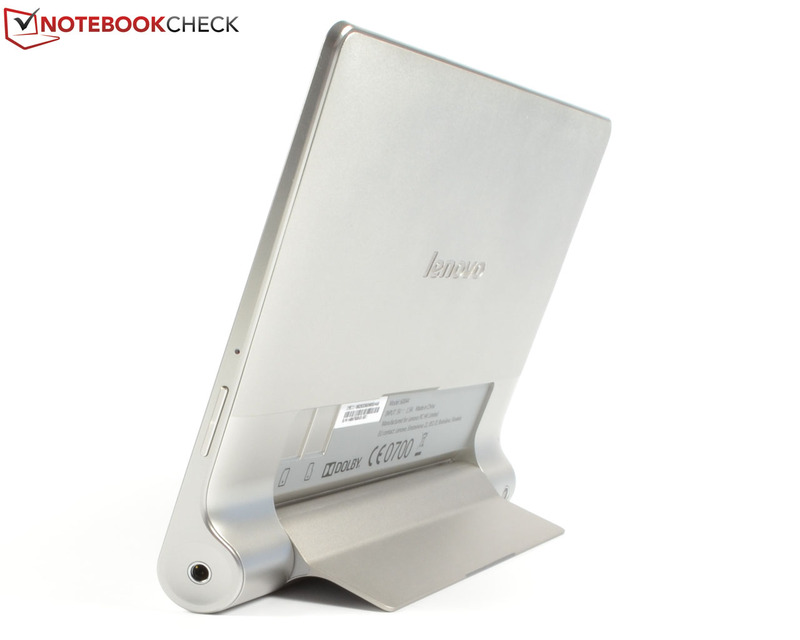 One of the great advantages of the powerful hinges is that the tablet remains upright even when the kickstand has not been fully extended (as long as it stands in a balanced way). 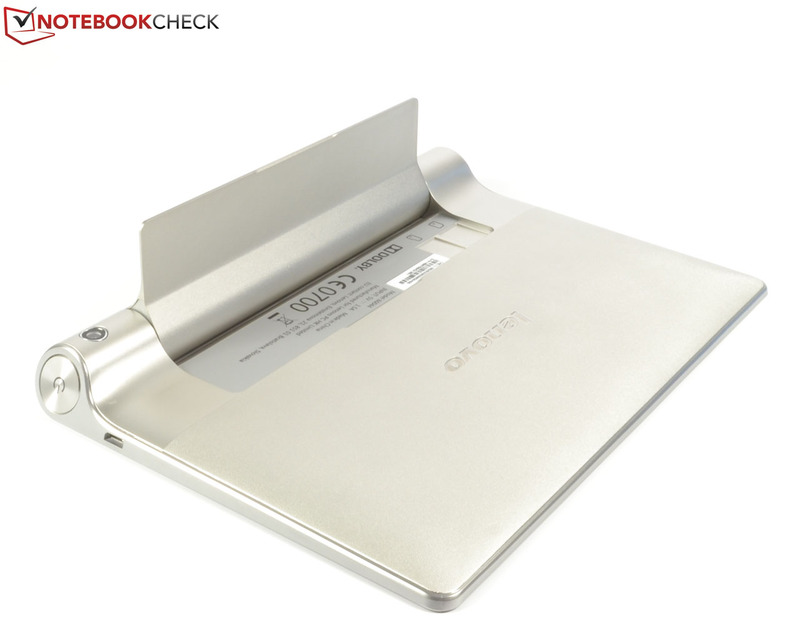 While used in angled mode, the tablet exhibits an angle of around 20 degrees (kickstand folded out), making it great for typing. 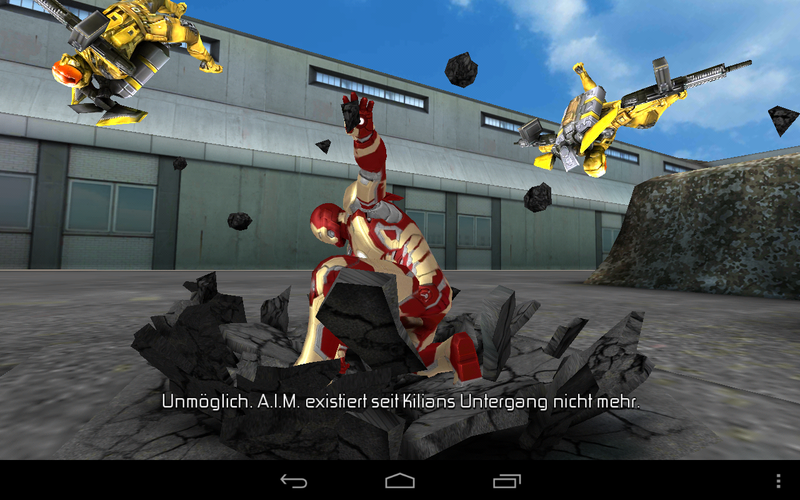 The only mode where the kickstand is of no particular use is the so-called hand mode. ...houses the battery, but also a sturdy kickstand made from aluminum. 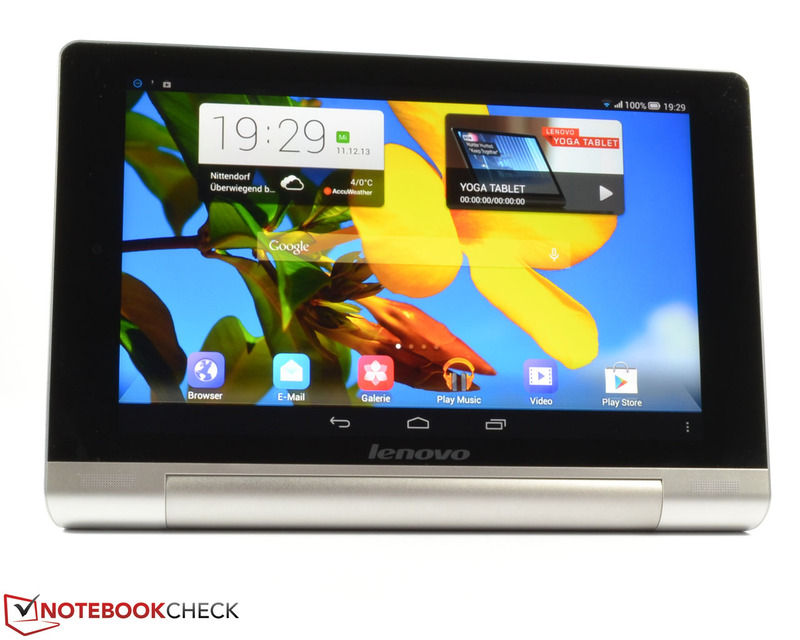 The Lenovo Yoga Tablet 8 is powered by a MediaTek MT8389 quad-core CPU with a clock speed of 1.2 GHz and an integrated PowerVR SGX544 GPU. It comes with 1 GB of LPDDR2 RAM and 16 GB of flash storage (net worth: 12.87 GB). 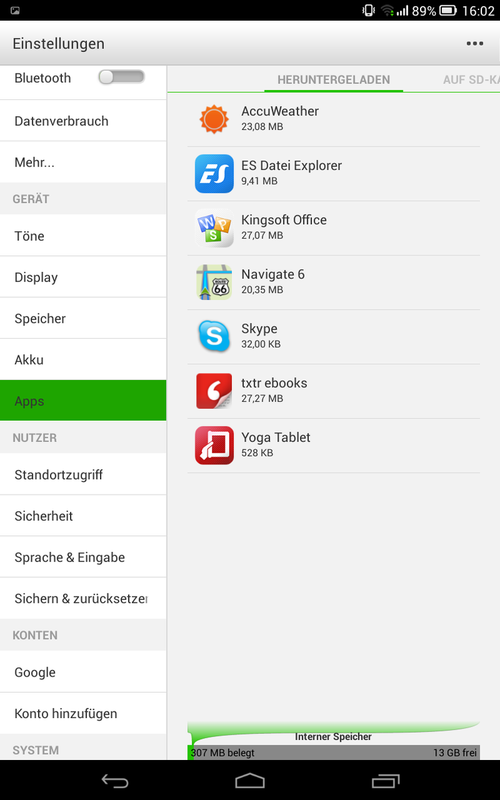 As usual for tablets, there is not much to say in terms of connectivity. The microUSB 2.0 port supports USB-OTG (On the Go). 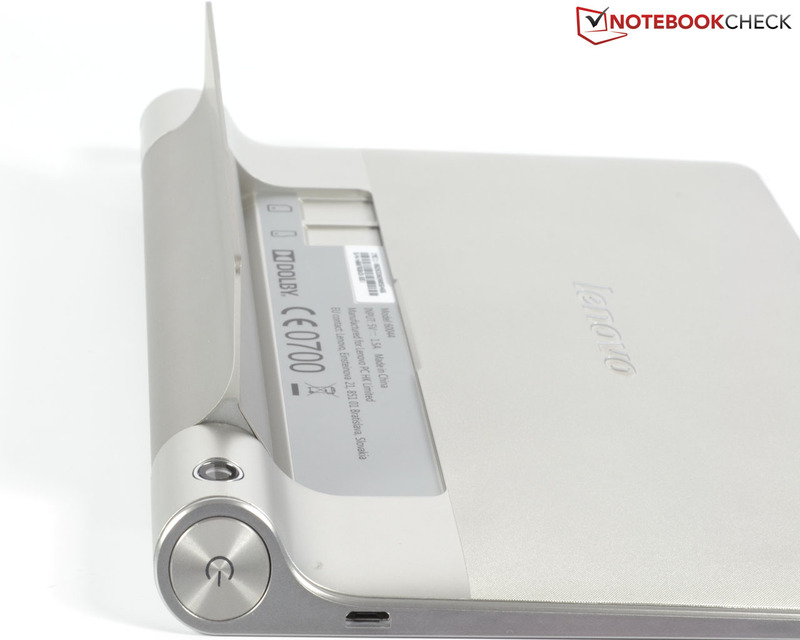 Then, there is a 3.5 mm audio jack as well as microSD (up to 64 GB) and micro SIM card slots, hidden beneath the kickstand. 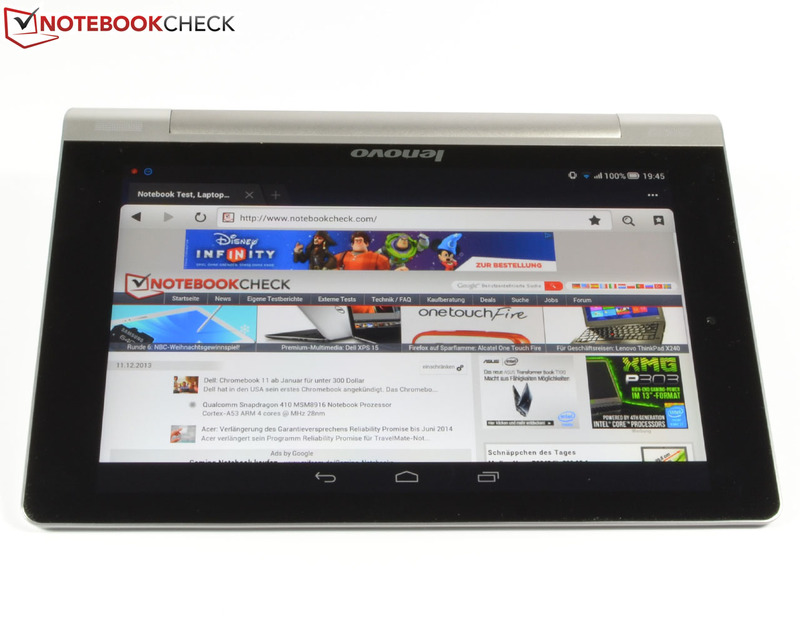 The operating system of choice of the Yoga Tablet 8 is Android 4.2.2 Jelly Bean. 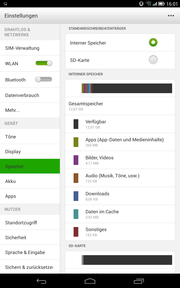 Some small adjustments made by Lenovo result in all apps being visible on the home screens instead of a sub-menu. As soon as the tablet gets rotated, both the display and the sound emissions adapt accordingly to all three modes. All further information about these software adaptations can be found in our detailed review article about the Lenovo Yoga Tablet 10. 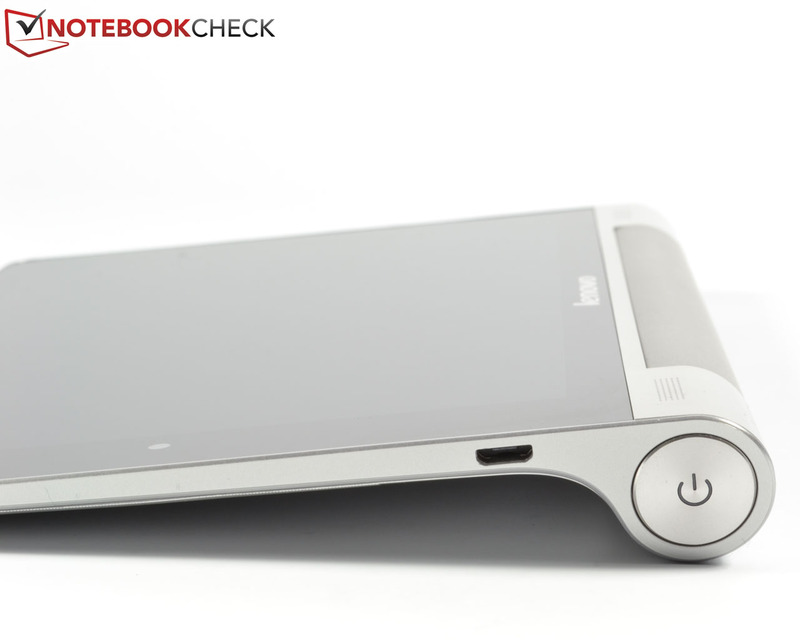 The Lenovo Yoga Tablet 8 ships with a Wi-Fi module (802.11 b/g/n) as well as Bluetooth 4.0 and UMTS/3G. All radio modems worked great, even at a distance of 10 meters, with a few walls being in between the router and the tablet. 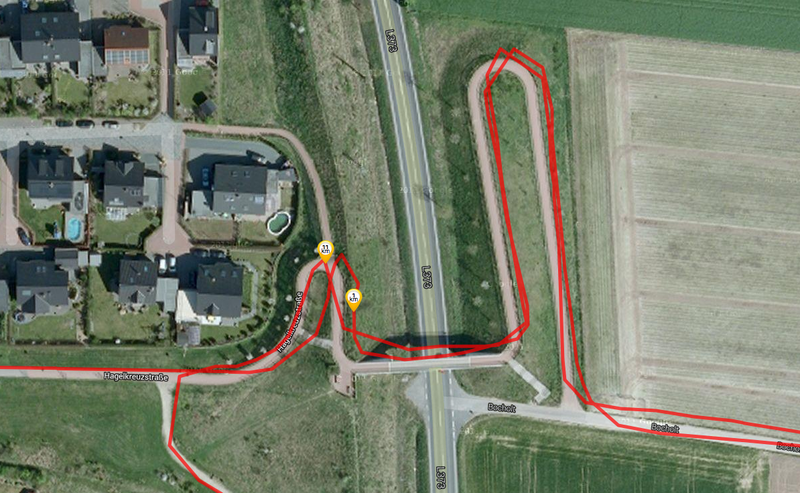 The GPS module has been tested with the app GPS test, taking a few minutes to find 8 satellites. Our real-life navigation test yielded similar localization issues. When compared to a professional device (the Garmin Edge 500), the Lenovo Yoga Tablet 8 takes a route which is shorter by one kilometer! 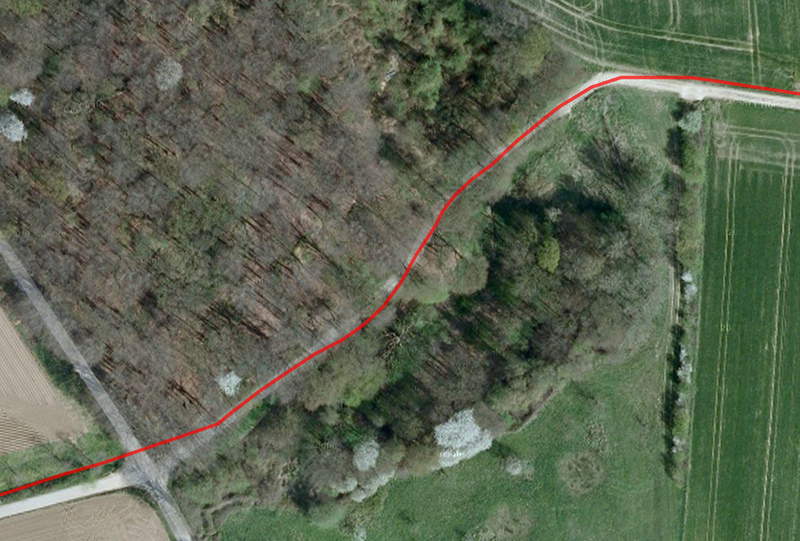 While it worked rather well when the road was straight, when it wasn't, the device often expected us to be elsewhere, plotting zigzag lines instead. Overall, this is just an average result. ...but the front camera always yields slightly blurry images with distorted colors. The camera modules are the same (down to image quality) as the ones used in the larger sibling, the Lenovo Yoga Tablet 10. Detailed information can be found in that review. 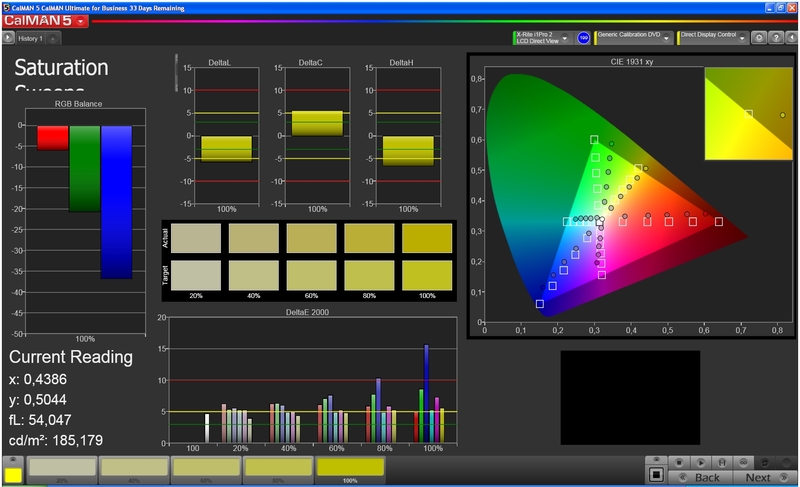 When compared to our reference camera, the Nikon D3100, and an iPad Mini Retina, the main rear camera of our test device (5 megapixels) produced slightly washed-out colors and a lot of noise in low-light environments. The webcam (1.6 megapixels) is good enough for video calls as long as the room is well lit. Still, we are surprised to find it at the left-hand side of the device (when used in stand mode, which feels like a suitable choice). Again, the image quality is not even mediocre, with low sharpness levels and distorted colors. The tablet ships with just a (modular) power adapter with a USB cable and a quick-start guide. A number of colorful covers will become available for purchase soon. In addition, the Lenovo P950 headphones (with headset functionality) can be bought for around 20 Euros (~$27). 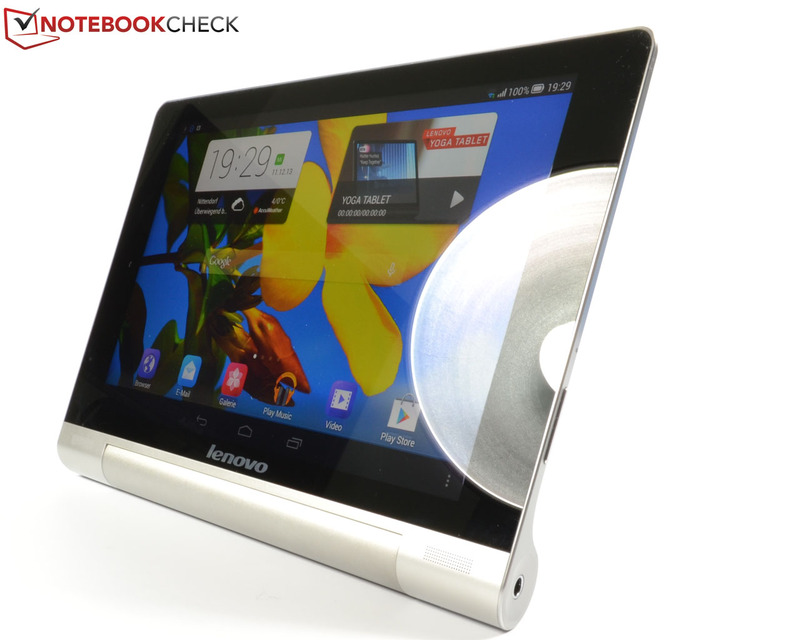 Lenovo offers a standard warranty of just 12 months for production errors when it comes to the Yoga Tablet 8. The virtual keyboard comes pretty close to the experience of stock Android, reducing the remaining space on the screen by almost two-thirds when used in stand or angled mode. In portrait mode, more than half of the display area remains visible. The capacitive multitouch screen works reliably, yielding low latency times. We didn't come across any issues during our tests. The Yoga Tablet 8 comes with an 8-inch IPS touch screen with a display resolution of 1280x800 pixels. Some competitors such as the Google Nexus 7 or Amazon Kindle Fire HDX 7 offer higher-resolution screens with 1920x1200 pixels while others (such as the Samsung Galaxy Tab 3 8.0 SM-T310 or the Bullman Tab 8 Mini AQQI) ship with a similar low-resolution HD screen. Its average brightness of 447.9 cd/m² as well as the maximum value of 465 cd/m² are top-notch - just the Google Nexus 7 gets brighter (513.4 cd/m² on average). 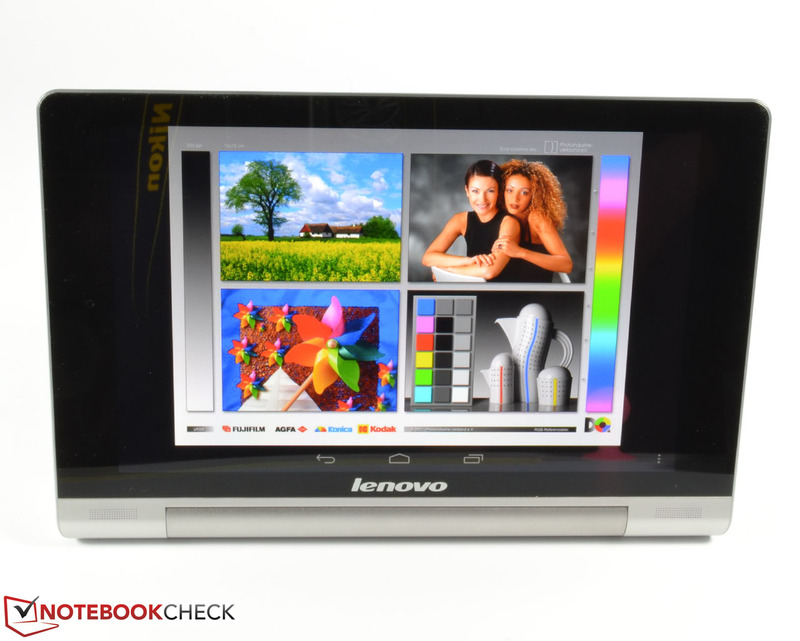 Especially great: The brightness homogeneity of 93% is better than everything Lenovo's competitors offer. 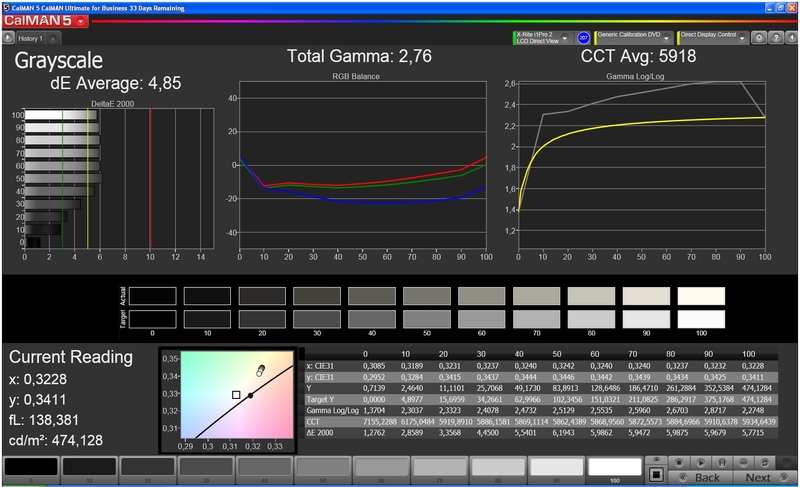 The black levels of 0.74 cd/m² might be somewhat better, but the resulting contrast ratio of 628:1 is still quite decent. 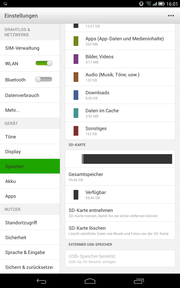 The Samsung Galaxy Tab 3 8.0 SM-T310, for example, offers 0.56 cd/m² and 764:1 while the Google Nexus 7 yields 1.07 cd/m² and thus a contrast ratio of 513:1. The CalMAN test yields only mediocre results. 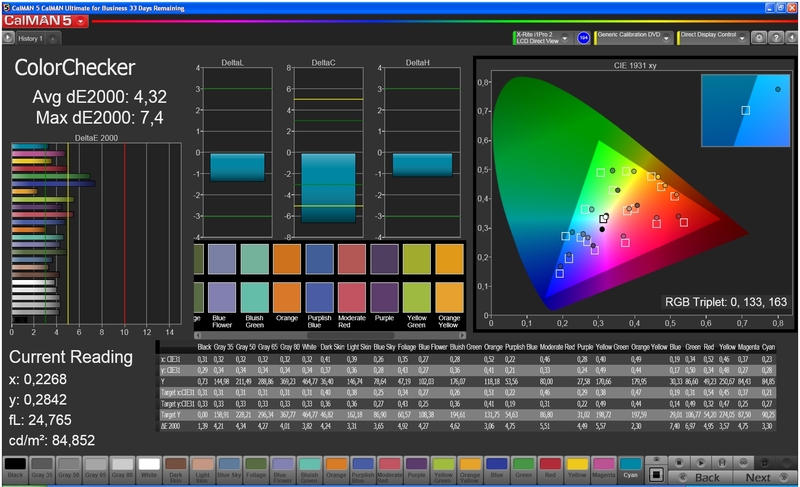 The color temperature of the Lenovo Yoga Tablet 8 is a lot less than the ideal value of 6500K, at 5918K. DeltaE deviations of 4.32 and 4.85 (color / grayscale) are noticeable, especially for blues. Still, during actual usage, the display looks nice, with vivid colors and decent black levels. Thanks to its high brightness and its more than decent contrast ratio, the Lenovo Yoga Tablet 8 is well-suited even for outdoor usage. Only under direct sunlight do the reflections on the glossy screen become problematic. 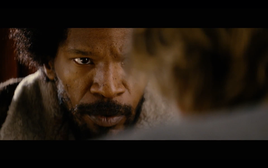 Other than that, all screen contents remain easily recognizable. Great viewing angle stability is a no-brainer, as is the case for most IPS panels. 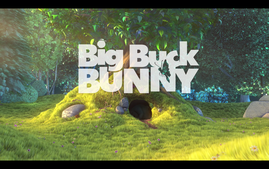 Even under unusually narrow angles, the image barely turns any darker with all colors remaining undistorted. 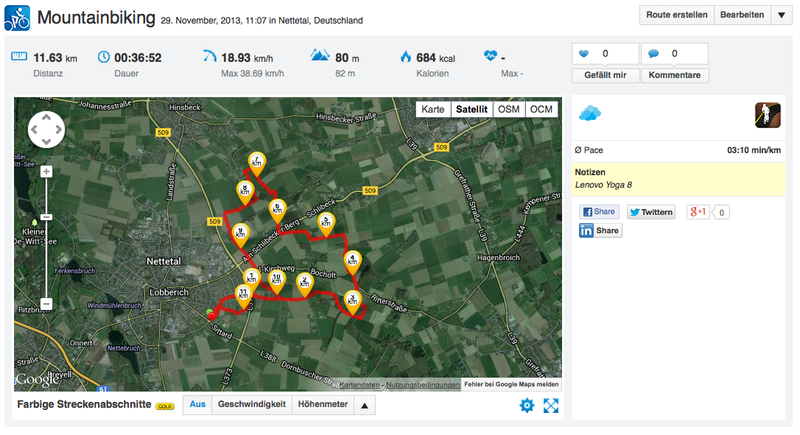 This allows several users to look at photos at the same time, for example. 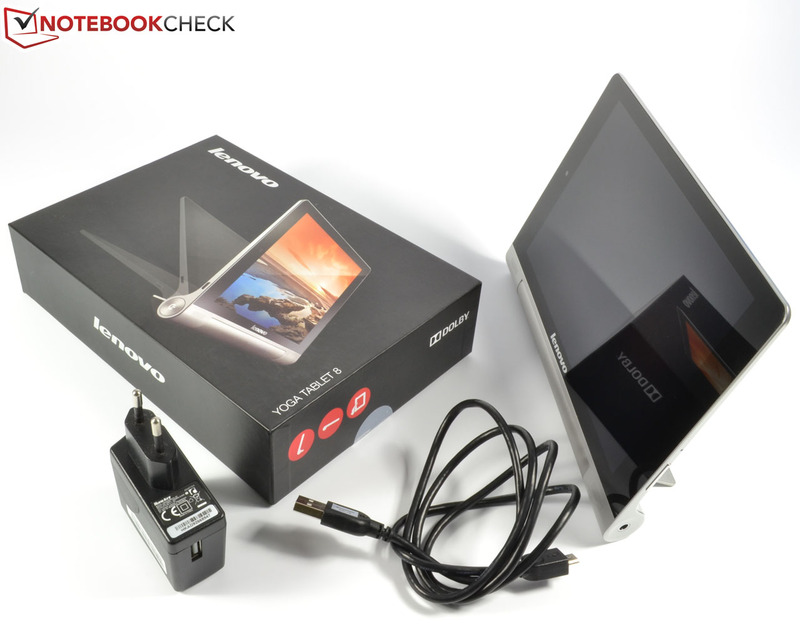 The MediaTek MT8389 quad-core chip used in the Lenovo Yoga Tablet 8 comes with a clock speed of 1.2 GHz and an integrated PowerVR SGX544 graphics card. It is more of an entry-level chip and by no means a high-end SoC. 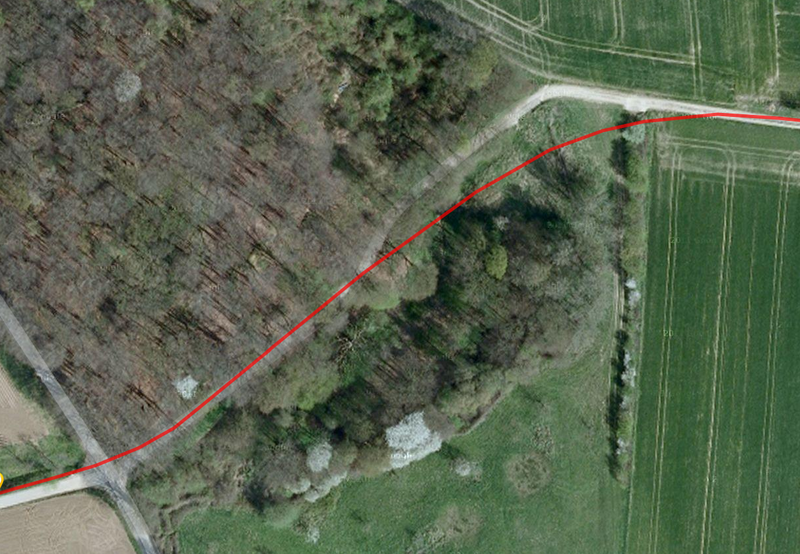 The variant without 3G is exactly the same, apart from this one feature. 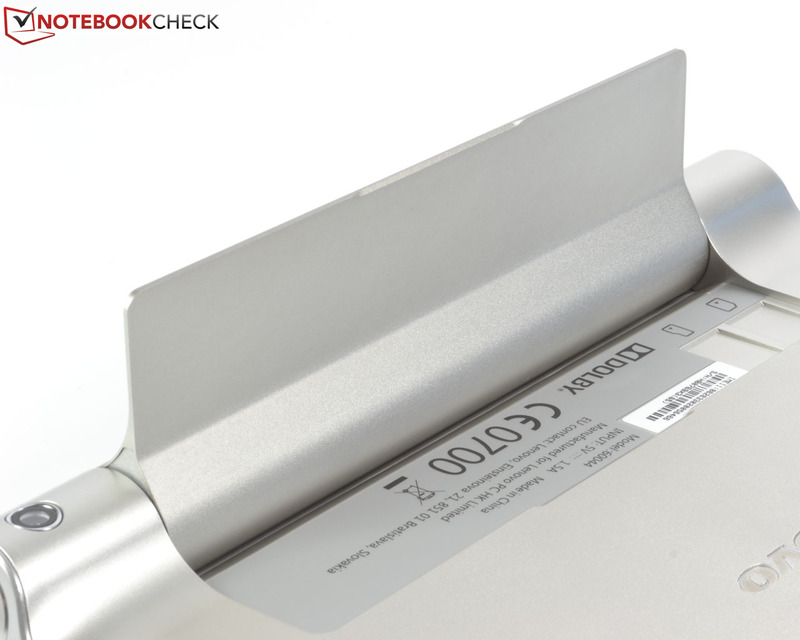 Our synthetic benchmark tests have not been an issue for the Lenovo Yoga Tablet 8. Still, the outdated innards show. Not only are almost all competitors faster (the only exception being Geekbench 2 and Smartbench 2012, where the Samsung Galaxy Tab 3 8.0 SM-T310 fares even worse), but actually by a large amount of 100% on average and up to 400% in extreme cases (especially for the Google Nexus 7 and the Amazon Kindle Fire HDX 7). 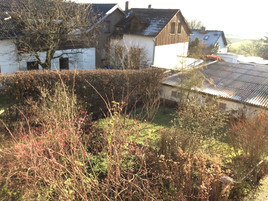 The browser-based benchmarks result in a similar picture. 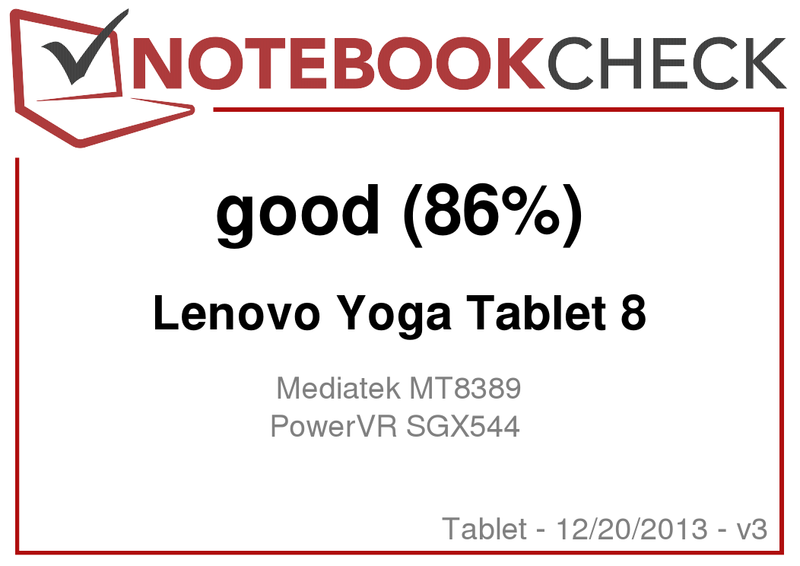 While most competitors are more or less on par in Browsermark 2.0, the Yoga Tablet 8 doesn't stand a chance in all other tests. Still, this is a lot less noticeable in real life than one might suspect. 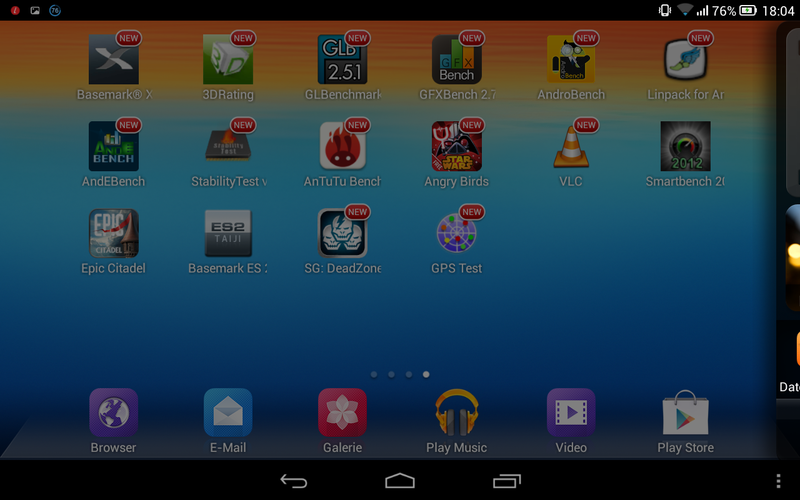 Browsing feels fluid and just plain fun, and multitasking works well too. While the integrated PowerVR SGX544 graphics card might not be known for its spectacular performance levels, it is a useable solution for most real-life applications and even most current games. According to the graphics benchmark Epic Citadel, the Lenovo Yoga Tablet 8 yields 57 fps in high quality mode and 59.6 fps in high performance mode. Even with ultra high quality settings, a very decent value of 23.4 fps is reached, actually more than most other competitors with the sole exception of the Google Nexus 7 (the low resolution of the display helps). We have tested a number of actual games, ranging from the ultra-fast 2D platformer Sonic 2 and the 3D action game Iron Man 3 to FIFA 14, a soccer game. More demanding games such as the recently released GTA San Andreas will, however, be too much for such an entry-level GPU. The input devices feel responsive. 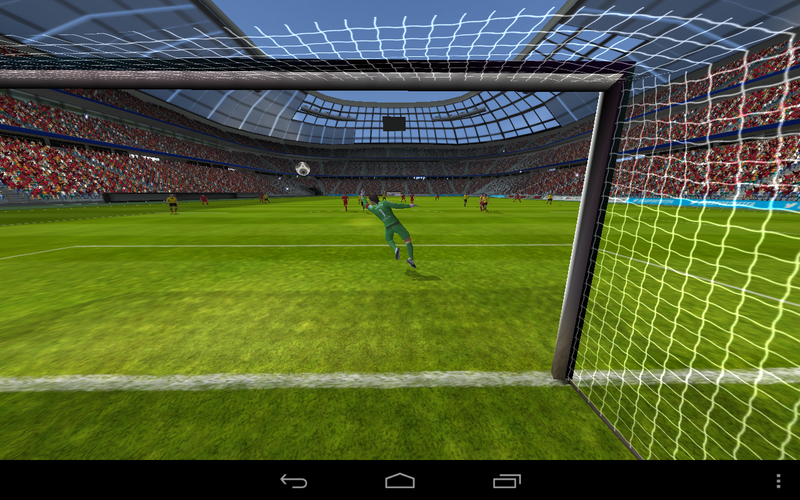 Both the touchscreen as well as the orientation and acceleration sensors allow for quick and precise ways of controlling the game. Even Full HD video playback works flawlessly, without any stuttering. 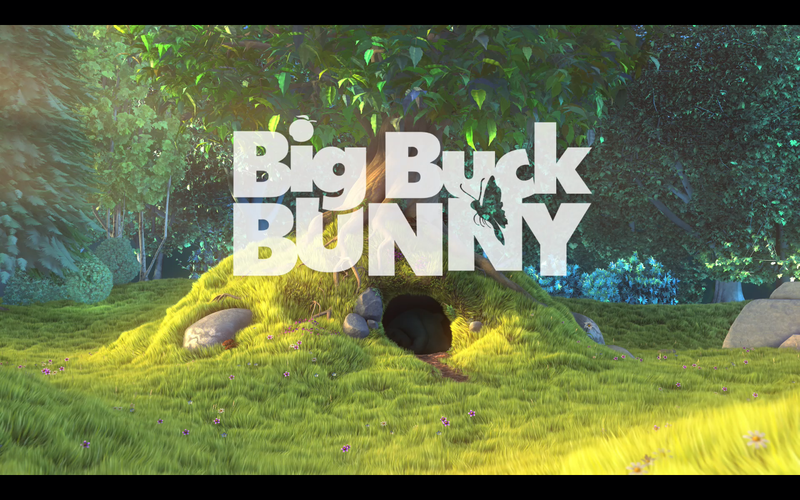 We tested both the short film "Big Buck Bunny" and the trailer of the (in)famous Hollywood blockbuster "Django Unchained". 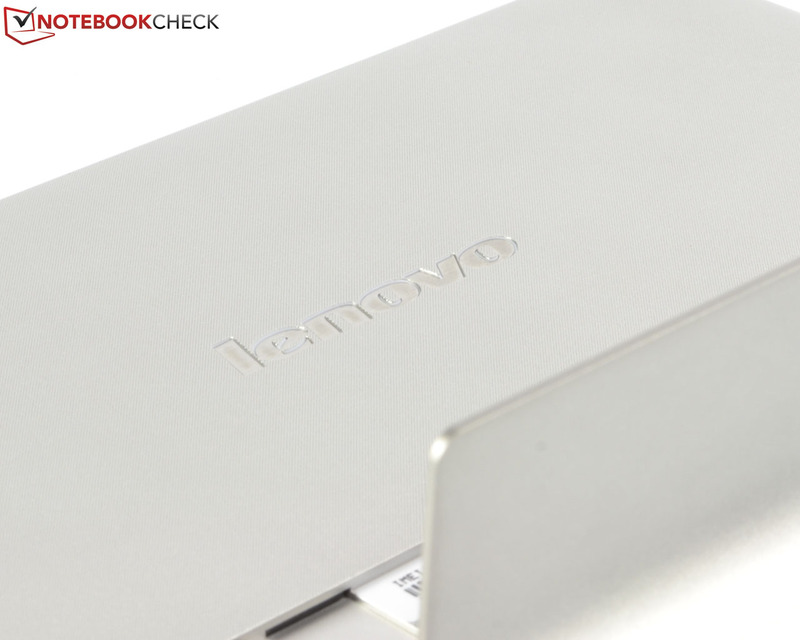 The surface temperatures of the Lenovo Yoga Tablet 8 are exemplary. 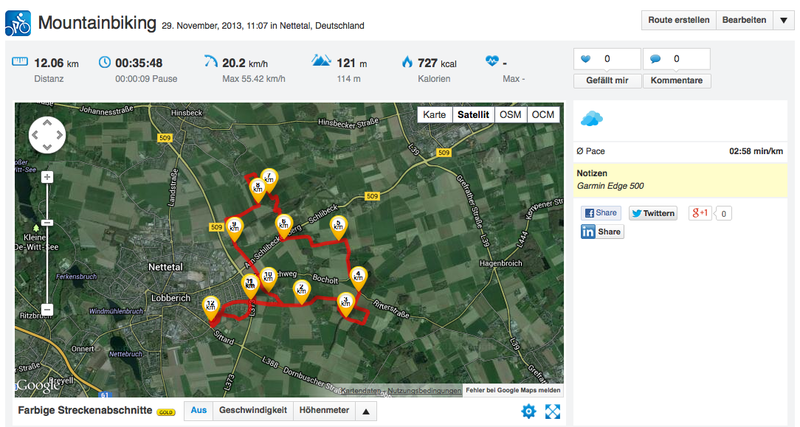 28 °C on average while idle is a great result, yielding a completely cool tablet. Even under continuous full load, as tested via the app Stability Test, no surfaces exceed 32.2 °C, with an average of 29 °C. 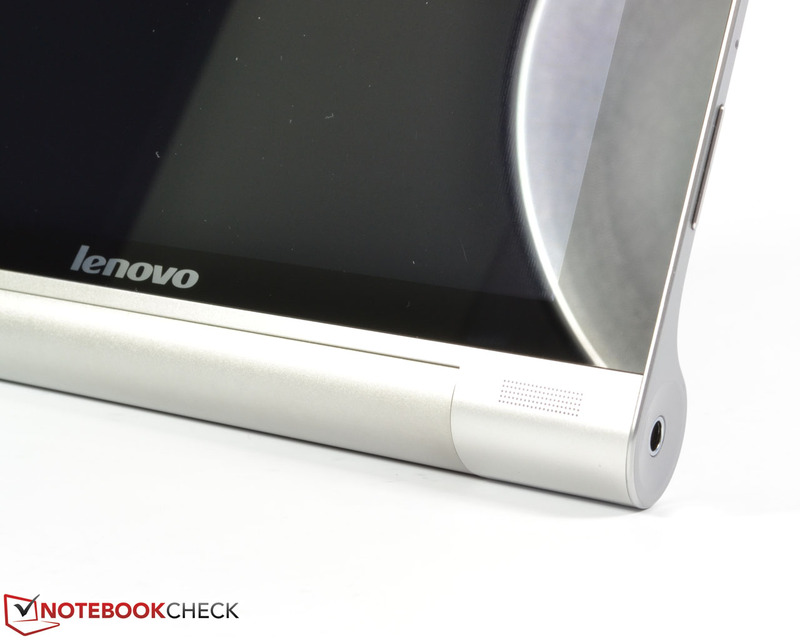 The stereo speakers of the Lenovo Yoga Tablet 8 are placed at the front of the device - which improves the audio quality a lot. In combination with the speakers being Dolby-certified and a multifaceted equalizer being used, the sound quality is one of the best we have heard on a small tablet. Of course, bass is lacking, and highs are dominant at higher volume, but this is to be expected given that this is still just a tablet. The 3.5 mm audio jack offers great maximum volume and an undistorted sound experience if good enough headphones are being used. 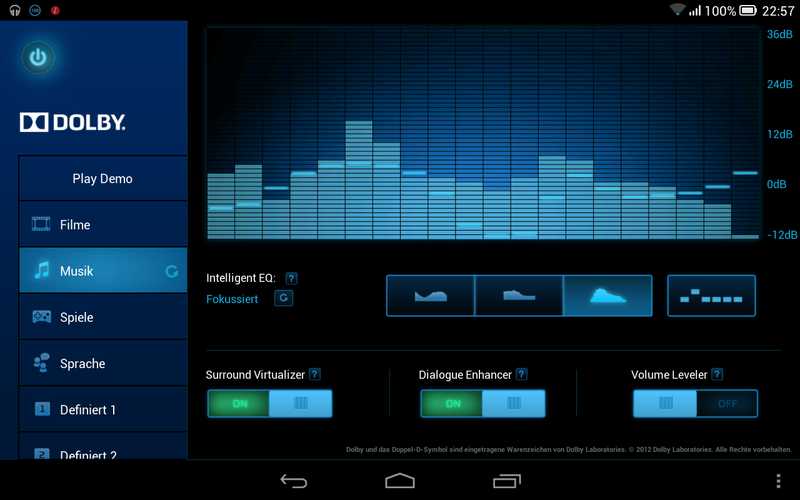 Front stereo speakers with Dolby EQ. The power consumption levels of the Yoga Tablet 8 come close to those of its competitors, but more than 2 watts both while on standby and while turned off is far too much. We suspect the power adapter to have too much power loss, which might also explain why it takes up to 5 hours to charge the tablet even when it is turned off. While idle, our test device required 3.9 to 5.7 watts. This is noticeably more than both the Bullman Tab 8 Mini AQQI (1.4 to 5 watts) as well as the Samsung Galaxy Tab 3 8.0 SM-T310 (1.3 to 3 watts). Under full load, 7 to 7.1 are needed (similar to the results of the Bullman Tab 8 Mini AQQI). Again, the Samsung Galaxy Tab 3 8.0 SM-T310 fares better with 5.4 to 5.8 watts. This is where the enormous 2-cell battery with 6000 mAh truly shines. While idle, the Lenovo Yoga Tablet 8 survived for an astonishing 32 hours - only the Google Nexus 7 manages to do better, with more than 44 hours. 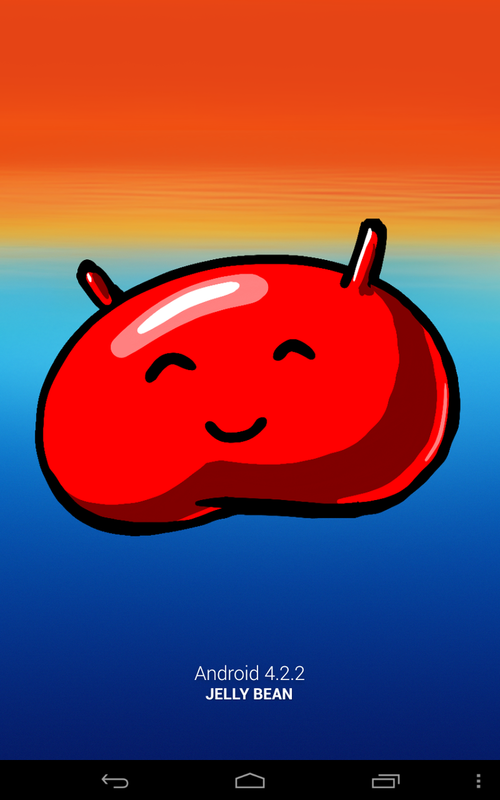 Under full load, 6.5 hours is achieved - this is approximately twice the battery runtime of all its competitors. 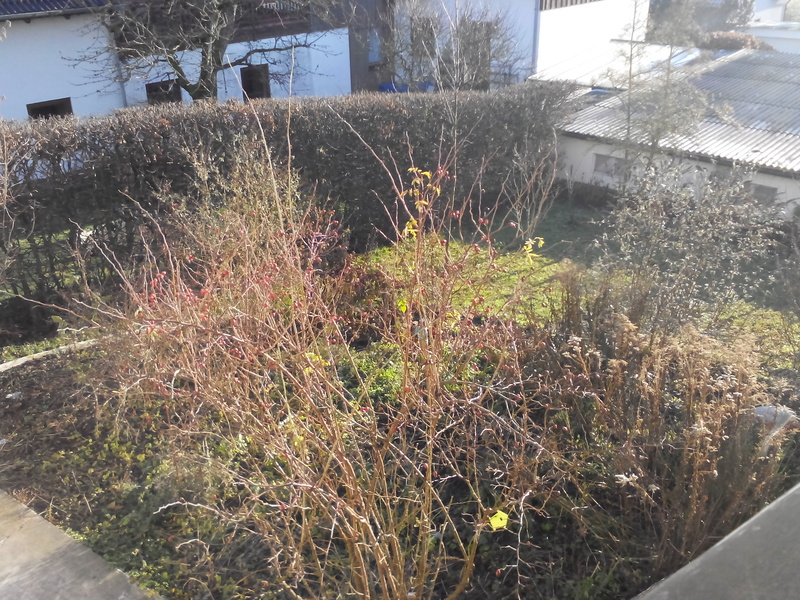 During our real-life browsing test with a mix of different web pages and brightness set to approximately 30% (150 cd/m²), a phenomenal value of 17 hours was achieved. This is far, far better than all of its competitors. Even the Samsung Galaxy Tab 3 8.0 SM-T310, the "best of the rest", only manages to stay alive for 7:43 hours. 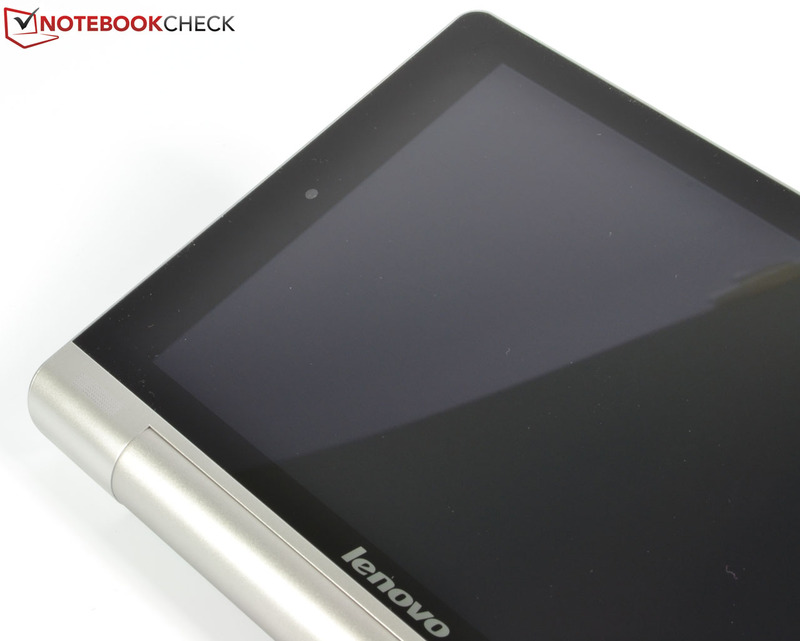 Thus, the Lenovo Yoga Tablet 8 is a superb endurance tablet which doesn't even have to hide when being compared to our previous champion, the 2012 version of the Apple iPad Mini. 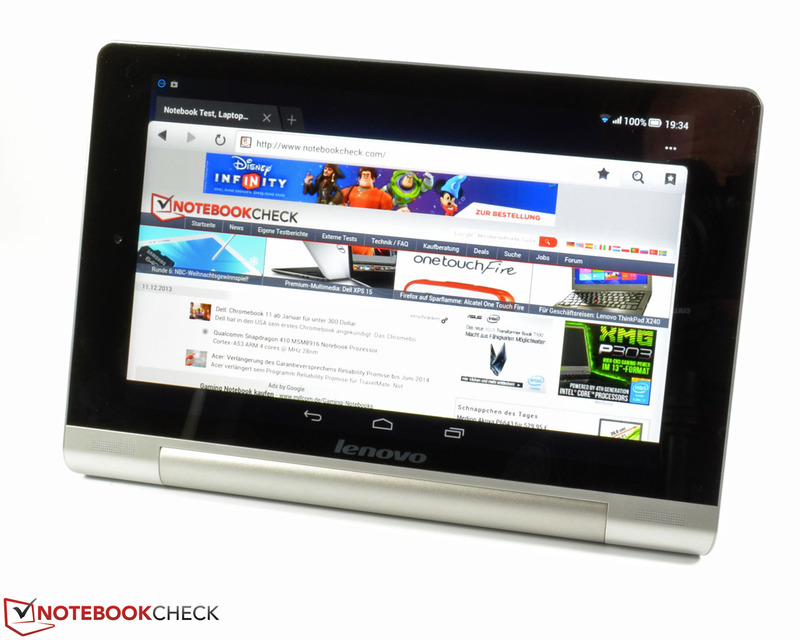 The Lenovo Yoga Tablet 8 is more than capable of standing its ground when compared to other small (Android) tablets. Its innovative shape is combined with average hardware specs and average performance. Still, the integrated kickstand is such a great detail that it more than offsets the rather high weight of the device, especially when combined with the good ergonomics of the tablet and its phenomenal battery life. Another edge: Its bright, high-contrast 8-inch IPS display, which comes with great viewing angles and decent image quality and the stereo speakers (placed at the front) which are definitely above-average with their Dolby EQ. 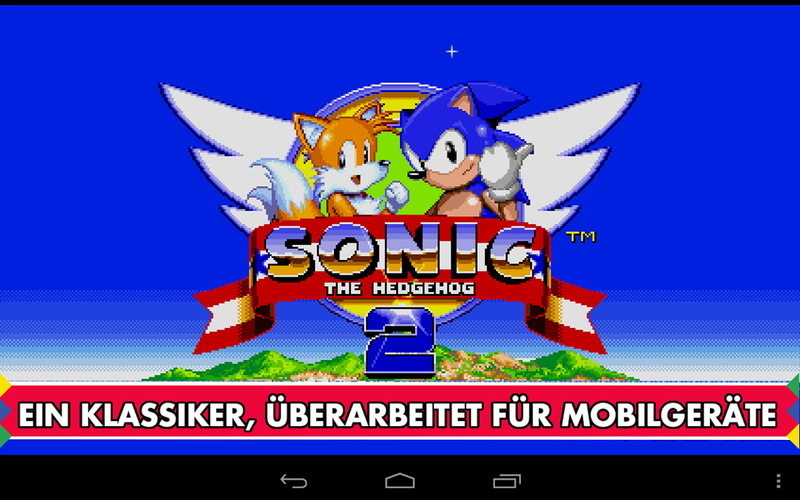 The 3G version even allows for mobile browsing. 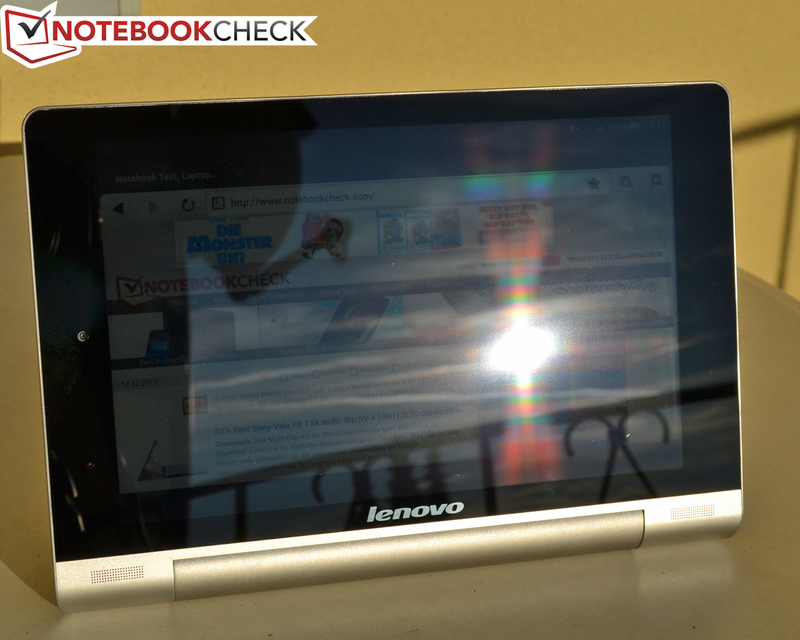 Unfortunately, the Lenovo Yoga Tablet 8 is not without its downsides. None of its less-than-stellar performance or the low torsion resistance of the plastic chassis or the mediocre GPS signal strength are enjoyable features. The camera modules and the overall signal reception strength are not great either, but these should be good enough during real-life usage scenarios. 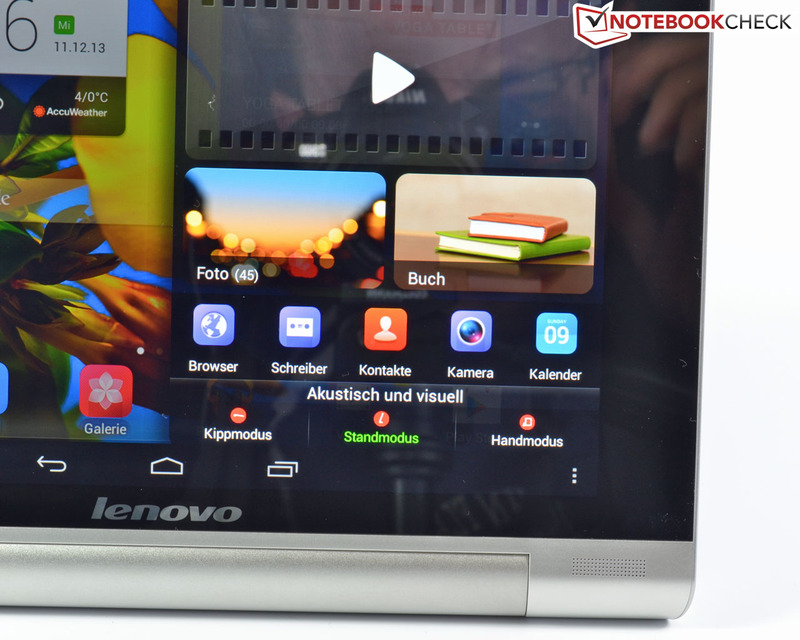 Thus, those who feel they might be happy with the highly unusual design and the minor shortcomings of the Lenovo Yoga Tablet 8 will find it to be a more than decent offer for its official price of 280 Euros (~$384, RRP). 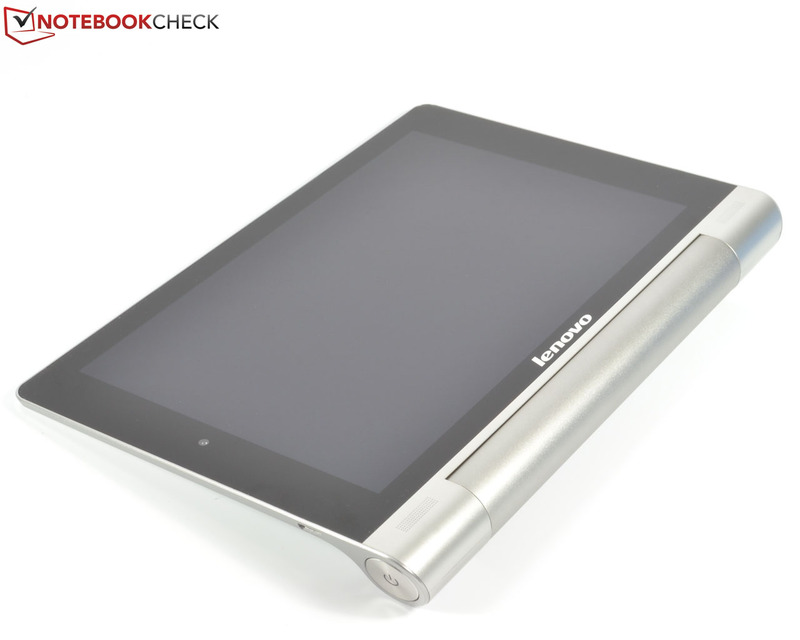 Lenovo Yoga Tablet 8: 8-inch tablet with an unusual design. Not much in terms of accessories. 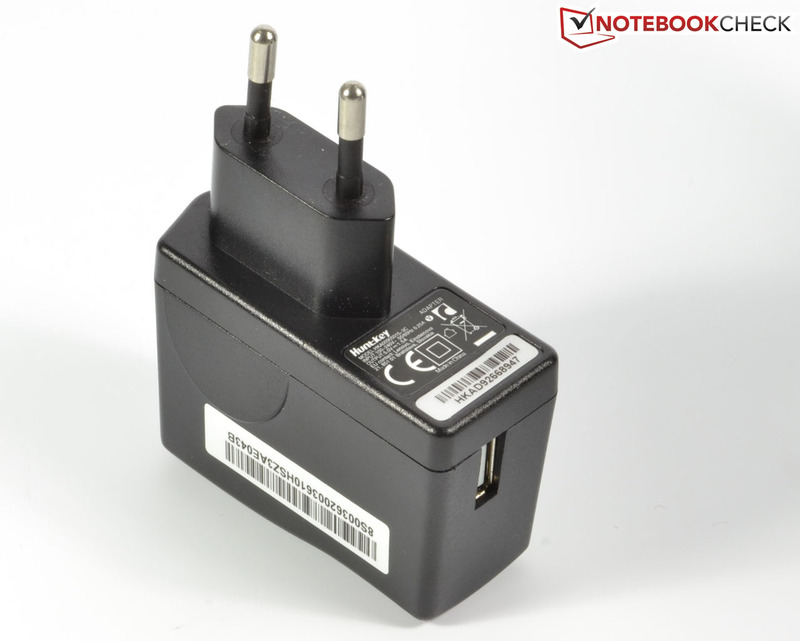 The modular power adapter has been made by a third party, supplying not quite enough power (5 V / 1.5 A). 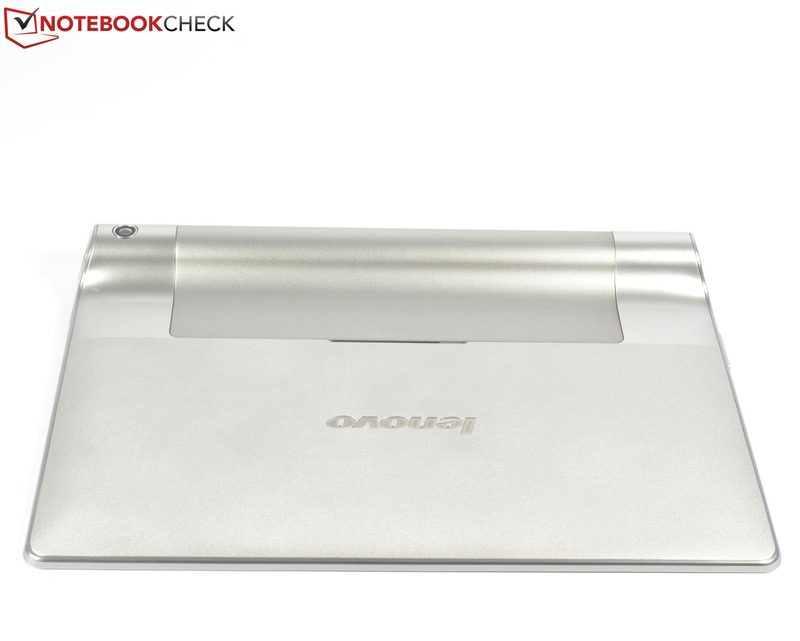 Lenovo offers precisely fitting covers for the Yoga 8. 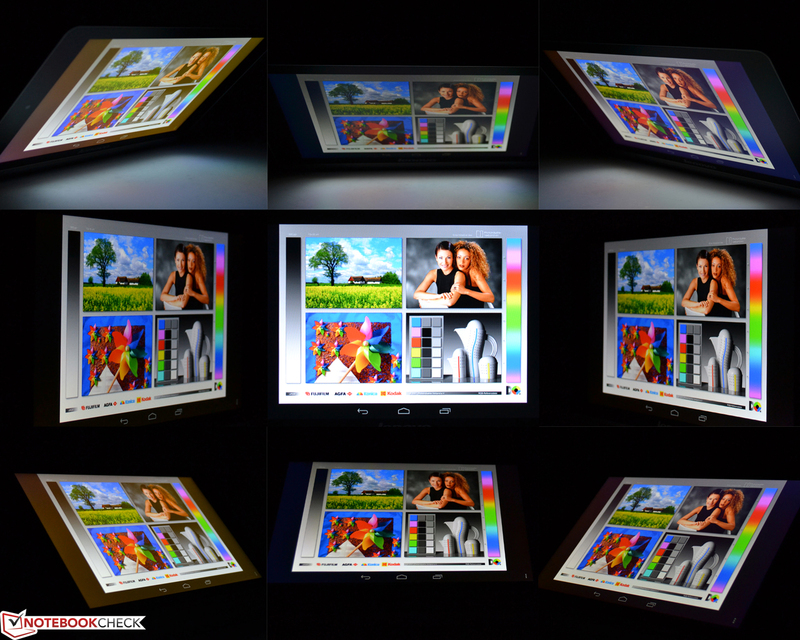 The touchscreen is highly reflective - as is the case with most tablets. 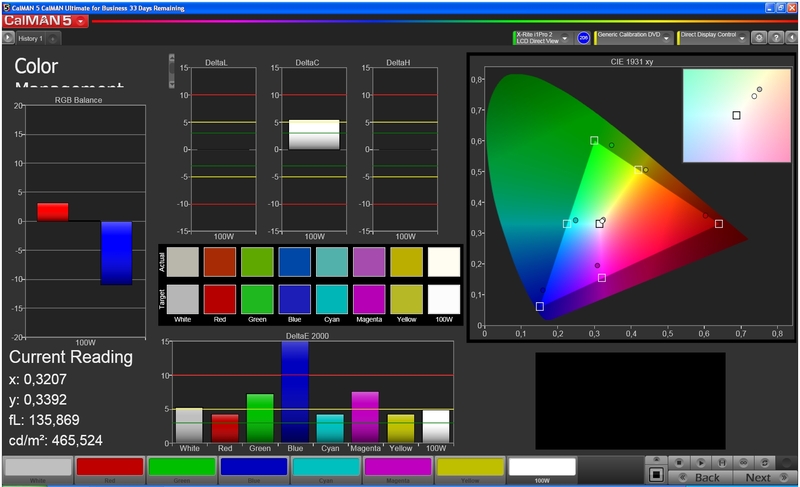 The 8-inch LCD offers a sufficient (but nowhere overwhelming) resolution of 1280x800 pixels. The viewing angles are superb, as with most IPS displays. When used in angled mode, typing on the virtual keyboard feels great. ...being kept in place by very tight hinges. Beneath the stand, the microSD and micro SIM card slots are hidden away. 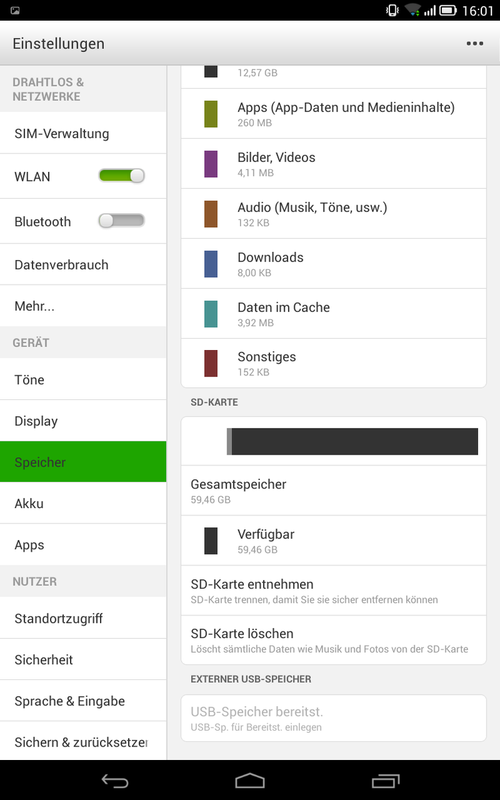 Up to 64 GB is supported without issues. ...locking firmly into place once it reaches its end position. 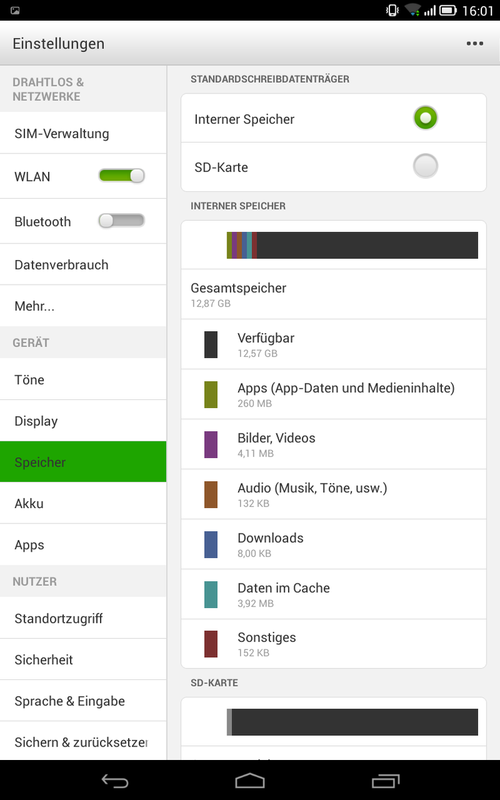 Almost 13 GB (of 16 GB flash memory) remains user-accessible. 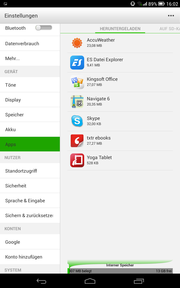 A number of useful apps such as Skype or AccuWeather come preinstalled. Newly-downloaded apps are marked as long as they haven't been used yet. 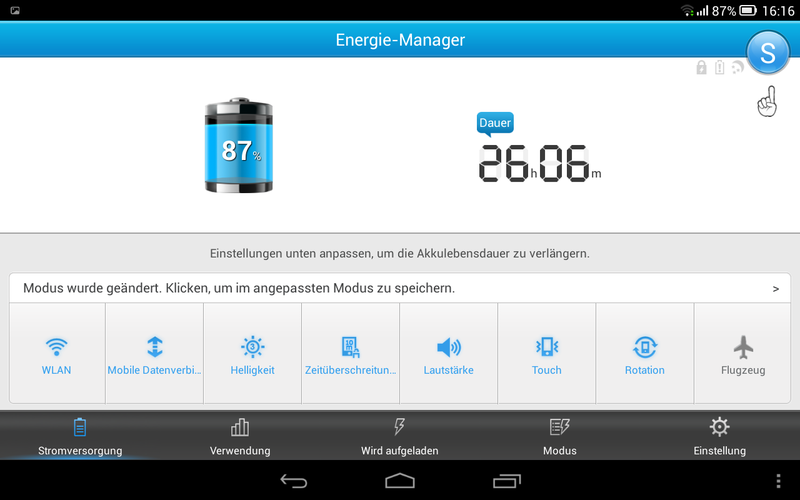 The energy manager delivers rather accurate battery runtime predictions. Rotating the tablet activates the appropriate sound profile. 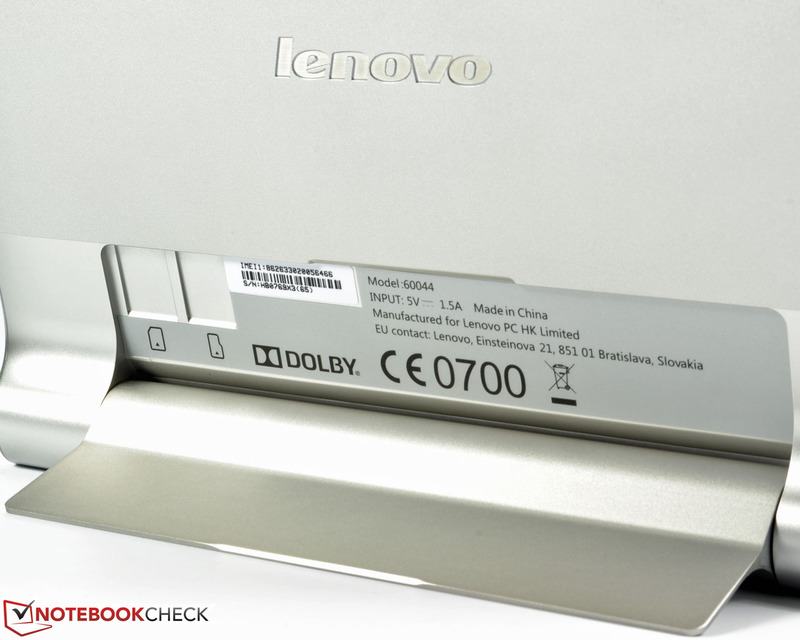 The stereo speakers are located at the front of the tablet, yielding more than decent audio quality. ...which offers numerous settings and which is capable of improving audio quality considerably. The power button requires a deep press. The volume rocker yields a ton of firm feedback. 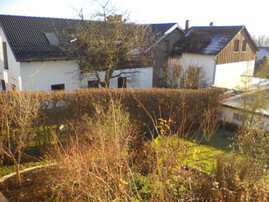 The main camera (5 megapixels) takes useable pictures, except for low-light surroundings. The innovative and adaptable kickstand. The way its sound output adapts to the orientation of the device. The great ergonomics even in hand-held mode, thanks to its battery bulge. An HDMI (out) port. Better chassis stability. The bright display and the phenomenal battery life.